The Aboitiz Group observes Earth Hour 2012 with its efforts to reduce Carbon footprint by partnering with the World Wildlife Fund (WWF) and the Cebu City Government. 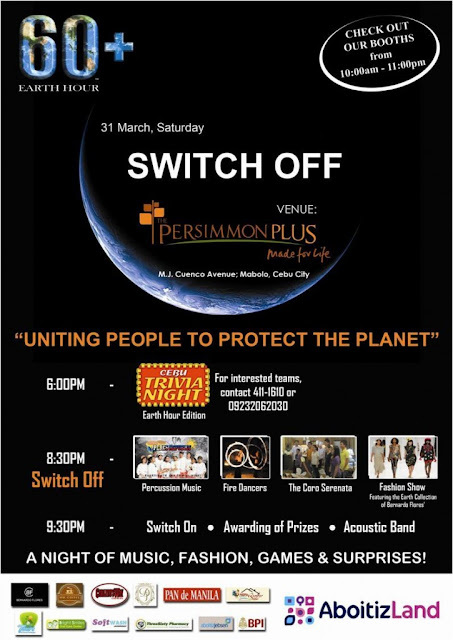 The Aboitiz Group and its partners will join millions of filipinos and worldwide in turning off inessential lights for an hour, from 8:30 p.m. to 9:30 p.m. on March 31, 2012, to conserve energy and lessen carbon dioxide emissions. This year’s Earth Hour theme is “Uniting Filipinos to Protect the Planet” The World Wildlife Fund will have a live streaming broadcast of the simultaneous Earth Hour activities taking place in Philippine cities like Manila and Davao. A messages of President Benigno Aquino III and international leaders of WWF will also be expected. Before the start of Earth Hour co-founder Andy Ridley will deliver his keynote message, which will also be shown through live streaming. Essay-writing and Poster-making Contests - High school and college students at The Persimmon Plus in Barangay Mabolo, Cebu City. Aboitiz Group team members and residents of Cebu City’s 80 barangays will walk 5:30 pm from the Fuente Osmeña to the Plaza Independencia as their way to support global environmental initiatives. Eco-Bazaar - Display of recycled items from waste and organic food at The Persimmon Plus. Percussion Music, Fire Dancers, The Core Serenata, Acoustic Band and Fashion Show still at The Persimmon Plus. Erramon Aboitiz, Aboitiz Group President & CEO will lead Group executives in the shut-off ceremony. He will be joined by Cebu City Mayor Michael Rama, Miss Earth 2008 Karla Henry, Miss Cebu 2012 Pierre Anther Infante and her court, and WWF representatives. Various activities are being developed across the Group through its five sustainability pillars of Reduce, Reuse/recycle, Rejuvenate nature, Renewable energy and Recharged communities. The Aboitiz Group has adopted sustainability as a strategic goal in the operations of its various businesses striking a balance among People, Planet and Profit. 0 comments: on "Aboitiz Observes Earth Hour in Colab with Cebu City & World Wildlife Fund"